I briefly witnessed a knife fight half a century ago. 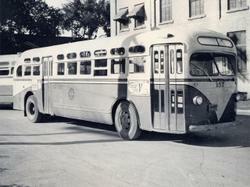 I was no more than 11 or 12 years old, riding an Augusta city bus from near my home to downtown. My plan was to spend the afternoon walking around downtown -- as I often did on Saturday -- looking at record albums at Davison's department store, and figuring a way to spend the quarter I had left (after bus fare) from my savings that week. When the bus was about 5 or 6 blocks from where I'd be getting off, it stopped for a red light. Out the window, to my right, a group of about 10 people had gathered on the corner sidewalk.... and right in the middle of the group were two men, slowly circling each other. It appeared to be a small pocket knife. He would lunge occasionally at the other man as they circled. Each had his arms spread in sort of a tackling stance. They'd just circle, with the occasional jabbing motion from the man with the knife. I watched in horror.... fascinated by what I was seeing. I can still feel that rush of adrenalin, or whatever it is that makes your heart pound when you witness such a thing. For a few seconds I could still see the men circling as I craned to look out the window. Then, they were completely out of sight. I do know.... half a century later.... hardly a week goes by that I don't think about that bus ride.... and that fight.